Cases of people infected with Influenza – A (H1N1) virus (earlier know as swine flu) is increasing. Influenza – A (H1N1) virus is contagious and spreading from human to human. The states (listed alphabetically) in India presently with confirmed cases of people infected with Influenza – A (H1N1) virus are: Andhra Pradesh, Assam, Chandigarh (UT), Chattishgarh, Delhi, Gujarat, Haryana, Karnataka, Kerala, Madhya Pradesh, Maharashtra, Tamil Nadu, Uttar Pradesh, West Bengal. It is necessary to take preventive action to control the virus from spreading. Most of the star hotels in Chennai are HACCP (Hazard Analysis Critical Control Points) compliant. Monitoring and adhering to guidelines issued by health authorities at regional, national and international level. Guests are being monitored to know whether they have symptoms of the virus. Vendors have been instructed not to deliver supplies through persons with symptoms of cold or fever. Ensuring that staff in hotels wash their hands with alcohol-based sanitizers, as they enter and leave . Staff with symptoms of cold, cough, fever or sore throat have been advised to stay away from the premises. Providing N-95 masks to all guests and associates. Handrails, telephones, elevator buttons, fitness equipment and office equipment are wiped frequently. Ensuring doctors are available at short notice to attend. Also people with certain chronic medical conditions, adults 65 years or older, children younger than 5 years old, and pregnant women may be at higher risk for severe illness. Cover your nose and mouth with a disposable tissue when coughing and sneezing. Dispose used tissues properly and immediately after use. Regularly wash hands with soap and water. If you have flu-like symptoms, seek medical advice immediately. If you have flu-like symptoms, keep a distance of at least 1 metre from other people. 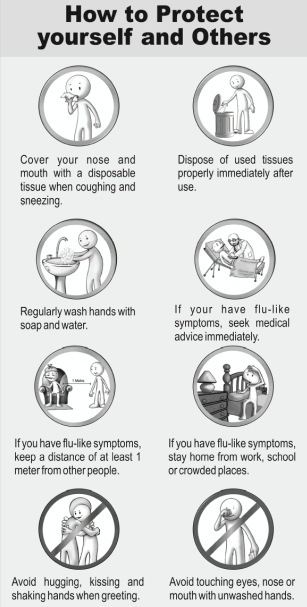 If you have flu-like symptoms, stay back at home. Avoid hugging, kissing and shaking hands when greeting. Also avoid close contact with others for 7 days after your symptoms begin or until you have been symptom-free for 24 hours, whichever is longer. For more updates on Influenza – A (H1N1) virus, log on to Ministry of Health & Family Welfare, Government of India. Read more from the Times of India. To view some interesting cartoons in Tamil, log on to Podiponnu.